The sky is falling, the sky is falling! Seriously, that is what I thought was happening last week as I started to hear about an article on October 8. The article published in the New York Times was about how picture books are losing their popularity. As I read the piece, my mind was racing. Picture books are such an amazing resource and now parents actually are knowingly pushing their children away from them in favor of chapter books. Yikes! My oldest son is seven years old now. As a second grader, I have to admit that I would love him to read more chapter books. Check that, I would like him to read some high quality chapter books to broaden his horizons. Unfortunately, my son has no real interest in them. He already finished the Magic Treehouse books, and read a few others in the past. Now, he’s more interested in flying solo to complete his 100 books for the Readers to Leaders program at his school. My philosophy: Reading is the most important part of this equation – read and I will be happy. Seriously, I am not going to fight my child. If he wants to devour 3-4 picture books in a sitting over a chapter book I am game. The end product is he is being exposed to people, places and things that he never would have met without the stories. 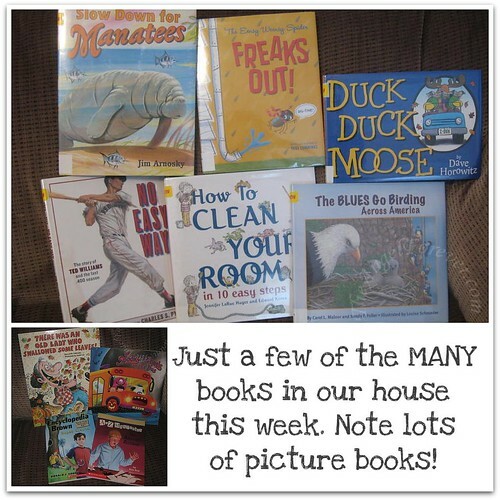 When we go to the library, picture books are a staple for us. I often pick out nonfiction books by authors like Gail Gibbons and others to offer different genres. As a second grader, I am able to talk to my son and ask him what genre of book this would be. He can also answer how did the author wrote it, what are the story elements are, and more. Yes, he can answer these important questions which not only assist him as a reader, but encourage him within his own writing. When I was teaching Language Arts to sixth graders, I also used picture books. Yes, even at the middle school level picture books can play an important role. One of my units of study was the book (chapter book) Ella Enchanted. We started off the time by reading a variety of Cinderella stories. For several days, we sat for story time listening to different tales of Cinderella and family. My students learned about different cultures and were able to see how different authors interpreted a classic tale. Comparing and contrasting the stories using Vehn Diagrams (a skill needed for ELA exams) was then completed along with some other tables about the books. Next, we listened to Ella Enchanted on CD. Then we watched the movie to write an essay on the difference/similarities of the book and movie Ella Enchanted (the lesson learned – you can not watch a movie to do a book report). At the same time, my students were also creating their very own Cinderella story to publish. We went to the computer labs to type them up, print them out and eventually they were bound with their own illustrations. It was an amazing accomplishment all thanks to the inspiration of other picture books read. I would love for you to chime in on this hot topic in the world of books. What do you think about the role of picture books in the world? Brimful Curiosities – Do you buy picture books? We do! I would like to thank the authors and publishers of picture books for their creations. The memories that I have from readingy your books as a child, teacher and parent are one that will forever be in my heart. I think a lot of picture books are pieces of art, illustrators give my child’s first glimpse into the world of art. It is sad people feel the need to skip the wonderful world of picture books, I am thirty(ahum) and still enjoy a good picture book every once in awhile. I deeply suspect the assumptions of the NYT article. Perhaps children’s books sales are down due to the recession, and parents choosing to borrow rather than purchase books. Or, maybe the demographics are changing so that there are more teens than young children. I don’t know. But, I don’t believe that the lower sales of children’s books is due to parents pushing kids toward chapter books. I do know that in my family, even though I collect children’s books, now that my kids are older and all my shelves filled; I’ve slowed down my purchases. But that didn’t stop me from ordering Ray Bradbury’s The Halloween Tree this week. However, I used Amazon’s Two Day Click service because it’s convenient, and it saves me from temptation at the bricks and mortar bookstore. And now, I’m going to pull out my collection of Halloween picture books to get in the mood for the holiday. My kindergarten-aged daughter is very artistic and depriving her of the inspiring artwork inside picture books would be taking away her food for thought. While she enjoys the words and is doing well with her beginning reading skills, what she really enjoys about the picture books are the illustrations and the worlds (both imaginary and real) that are right at her fingertips, ready for exploration.